So when I wrote that I didn’t really have an issue with not having a dad, I must have been lying to my 8-year old self. 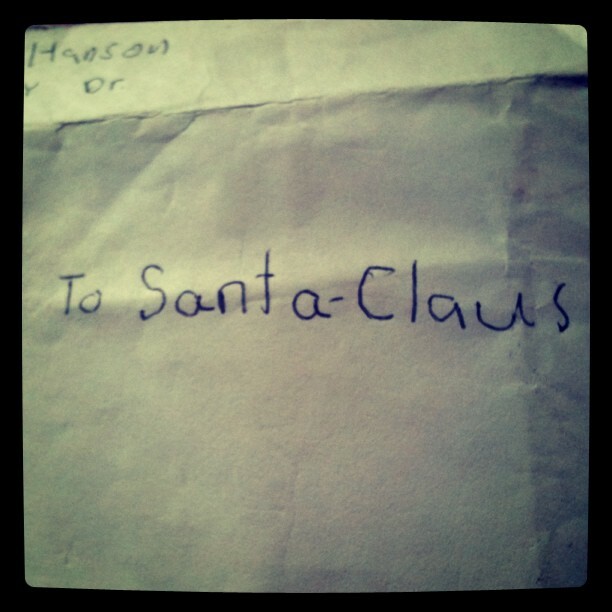 My mom recently found a letter I wrote to Santa Clause when I was 8. Warning: it starts funny, and then I make you feel like an a-hole for laughing at my letter. Ha. I’m leaving in all original grammar mistakes, which are embarrassing, but really make the letter pretty amazing. Have a verey nice Christmas. My mom told me she felt guilty about never sending the letter out. All I have to say is, THAT’S WHY I NEVER GOT MY DAD FOR CHRISTMAS! They decided to adopt. Then they decided to adopt from Guatemala. Then someone else decided they should actually go to Guatemala before they adopted a child from there: “You have to find ways to give back to a country that is going to be giving you the gift of a child.” It’s funny, isn’t it, how a simple nudge from someone else can completely change your life. Bill and Cherie did just that, and in 2004 they traveled to Guatemala, where they met Tita two nights before their flight back to the U.S. They had already spent eight days meeting people, places, and things. But they hadn’t met Tita yet, or La Limonada, or their future. Tita turned out to be their inspiration: a woman who for five years had been singlehandedly working in one of the most dangerous and largest urban slums in Guatemala: providing care, comfort and food to the most vulnerable of the vulnerable. La Limonada is basically a settlement in a ravine, considered a Red Zone area because of how dangerous it is, and home to about 60,000-100,000 people. These people live in one of 10 different districts, each of which are ruled by rival gangs and invisible but life-threatening boundary lines. What did Tita show Bill and Cherie on their last day in Guatemala? She showed them the shanties where families lived huddled together, she showed them families that dulled their hunger pain by sniffing glue, she told them about the sexual abuse that runs rampant in La Limonada, she told them about the gang violence and warfare that had her attending at least one funeral a week. But she also showed them the school she had started, she showed them the children she looked after, she told them about her plans for the future: how she wanted to be able to teach more kids, she wanted to reach out to gang members and show them a different way of life, she told them about wanting to start a vocational center for those gang members, she told them about wanting to send kids to school. Seeing and hearing these stories changed their lives. As much heart and as many plans as Tita had at the time, she was overwhelmed by the amount of work and money that it took to do everything she was doing or wanted to do. Bill and Cherie saw the need and opportunity to step in and help, and they did. And you know what? They’ve pretty much made all of Tita’s plans a reality. A vocational training program was started that teaches gang members skills they can apply in obtaining jobs around La Limonada, whether in construction, carpentry, or other areas (interesting tid bit about people from La Limonada who try to get jobs: if you put an address from La Limonada on a job application, you’re pretty much guaranteed to NOT get the job). This is all just the beginning stages! Bill talked about their plans to buy a building that will house the vocational training program. The program is still in the initial stages, and often they don’t have the room or a safe location to consistently have their classes in. They are currently looking at a building that is located in between the two schools, they just have the difficult task of raising the funds to purchase it. Ideally, this building will house training classes for sewing, carpentry, masonry, electrician training, etc. Of course, these accomplishments and goals for the future are no easy feat to come by: Lemonade International is working in a country with difficult and straining conditions, among a dangerous population, and with the mentality of wanting to establish something that is not dependent on U.S. donors, but self-sustaining. Sustainability. I love that word. One of the goals for the vocational center is that it will create businesses, like bakeries and carpentry shops, that will help maintain some of the other programs. The are trying to get this sustainability started by looking for a local Community Development Director: someone who will oversee all the programs in Guatemala, and to focus on the sustainability and long term plans of current projects. This brought us to something else Bill thinks is important for the future of Lemonade International: engaging local people in Guatemala to support the work of La Limonada, to inspire them to care about their own country. We had an interesting conversation about classism in Guatemala: there is still a great divide between people of different socio-economic levels, not to mention indigenous mayans vs. ladino’s. It would be great if instead of having people from the U.S. going to Guatemala to lead these programs, you have Guatemalan’s caring about each other across these socio-economic divides, and leading these programs. Bill recognizes that something like this will take time, and is steering clear of setting himself up for an “unrealistic disappointment.” He knows sustainability is something that will take time, and until then, raising support in the U.S. to help kids go to school, which may not be sustainable, is better than doing nothing. I want to stand on the bridge overlooking La Limonada, and see people walking around confident in themselves and knowing their self worth, see people who know they can achieve things, that they are part of a community where good things are happening, a community with art, and music. I want to see houses painted with bright Guatemalan colors, and flower boxes hanging under windows. I want to see the hustle and bustle of business: tortillas being delivered, schools in session, festivals and parades. All of this, with no concern for violence. In Guatemala, things have to change and the aggressors have to know that their only place is in jail. Since 2001 I have worked and investigated the subject of femicide and aggression against women in Guatemala. I find it interesting that we have such an aggressive male population, that has caused more than 6 thousand women to die in the most cruel ways: tortured, severed in their private parts, raped, and mutilated. In those days, Ciudad Juarez was a site of murders that moved the world. Ten years later, Guatemala left Mexico behind. I got to know the case of Mindi Rodas, the woman who’s husband ripped off her face, nose and mouth with a knife and after a long battle for justice was murdered. I got to know the case of Claudina Vasquez, a young woman who was going to be an attorney, that was first raped and then put on her knees to die with a bullet to the temple. Towards the middle of this decade, while I was going through my masters in sociology, I completed a thesis about femicides in Guatemala, and then I had to course through the morgues, see puddles of blood that wet my shoes, the bodies of dozens of women that arrived cut in pieces and their faces bruised. That year, when I started my television project of Informe Especial (Special Report) on Canal Antigua, I decided to go back and check the pulse of this silent drama. I didn’t even have to take a step to realize that the problem had surpassed us. In July I started to investigate the disappearance and murder of Cristina Siekavizza, where the principal suspect is her husband Roberto Barreda. A story already known by everyone, but where the aggregate of influence peddling, abuse of power by Barreda’s parents, Beatriz De Leon and Roberto Barreda, has been an important factor in keeping this case without any punishment and allowing the two minors to disappear along with their psychopath father, according to those who have declared to know the case: the judge Veronica Galicia and Norma Cruz. I have found myself with more than three dozen messages and letters from women commenting that the story of Cristina has made them understand the dangerous drama in which they are submerged. Many, for the first time, seeing the criminal extremes that Barreda allegedly reached, are daring to break the cycle of violence and raise their voice. Norma Cruz, president of the Fundacion Sobrevivientes (Survivors Foundation), told me on one occasion that Guatemalan woman has started to talk about what she called the “Barreda Syndome,” many of the attacked women are seeing in Roberto Barreda, a man that appeared to not be aggressive but that was a despot at home, their own husbands. 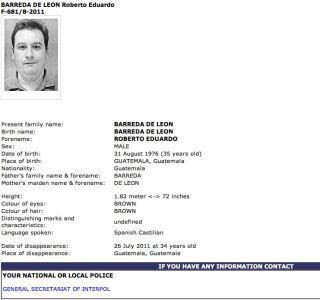 En the case of Barreda, nobody saw the alleged murderer of his spouse coming. But when everyone reacted, Cristina had ceased to exist and her children had disappeared. I have always believed that we all came into this world with a mission, that no life is in vain, just like no death is in vain. Cristina has moved more hearts and sentiments with her death than she did with her life, this is a sign that her spirit continues still today and it can be the point of inspiration so that many women who have been attacked start to talk and ask for help from prosecutors, support groups, or organizations in defense of women. For my part, these stories of terror that have hit so many guatemalan women hurt me to my core, and they motivate me to commit myself with what I will soon start as a new life project, to save thousands of women, teenagers, and girls who are victims of violence. If I can be sure of something, it’s that today, more than ever, I will not lower my voice and I ask the women that they don’t either. In Guatemala, things have to change, and the aggressors have to know that their only place is in jail. I translated a blog from a friend in Guatemala back in July, it was her battle cry for justice in a country that seems to spin further and further out of control. That specific blog was prompted by the disappearance of an old classmate’s sister: a wife and mother of two children. Since her disappearance, classmate’s have banded together, and have refused to let Cristina be forgotten as just another disappearance, or simply another statistic. Since her disappearance, events have continued to unfold, and evidence indicates that the night before her disappearance, her and her husband got into a serious argument, after which she ran out to the balcony of her home and screamed for help. No one did anything. Although her body has not been found, it seems the husband used the family car to dispose of her body, and disappeared with the children days later. They have not found the father, or the children, and the plot is more convoluted than a simple disappearance (the father’s parents are politicians, I think his mom may be a judge, so there are beliefs that the initial investigations and judicial proceedings were hindered by his parents and their connections), but the light at the end of the tunnel is that people have not stopped demanding justice. Some people have criticized the attention this case has received, stating that the only reason it’s getting as much attention as it has is because she was of a member of the higher social levels in Guatemala. It’s true that Cristina is only one of so many countless cases of victims of violence in Guatemala, but herein lies the difference: Cristina has friends who are not willing to give up. So many cases in Guatemala go unresolved, and those involved learn to simply move on with their lives: injustice is seen as something people just have to put up with…what else can they do? Seeking justice is seen as a waste of time, and so people remain disappeared, while those responsible are never even looked for. Instead of arguing classism or social divide, people should stand by this movement, and be happy that finally someone had the balls to demand justice. It’s more than many have ever done. The difference is not that Cristina was part of a more privileged society, it’s that she knew people who cared enough and were able to not give up. I applaud their dedication, and for the sake of a country who needs more people like them, willing to stand up to corruption and impunity, I hope many more will join them. The movie was great also. I’d write more, but it’s time for milk and cookies (for reals). These questions followed me back from Haiti, and some of the best conversations I had with people there involved the same questions I mentioned above. My initial idea was to simply write one blog about my thoughts, the issues I see, and possible solutions (according to the not-all-knowing me), and leave it at that. But then I thought it would be cool to take it one step further. So here’s my idea: have people who are similarly interested in answering the same questions do guest posts, where they can analyze the “how’s” and “why’s,” in whatever context they find appropriate. For example, I asked Haiti Scholarships co-founder Jim, and he’ll probably take on a more financial argument, being that he’s a finance professor and all (and was that a shameless plug for Haiti Scholarships? Yep. Did I post the same link three times? Yes). My disclaimers: I’m not claiming we have the solutions. Heck, people have been debating these answers for decades before I even came across them. My goal in getting different people to post their thoughts is simply to gain a little more insight about something I’m passionate about, and maybe open discussion about these same ideas. Unlike this guy, I don’t really know what I’m doing. Also, I’m not big on censorship of ideas, so I will allow people to write about whatever they want, but I take no responsibility for their thoughts or opinions! It’s been roughly two weeks of slowly packing and moving everything out of our place. Yesterday we moved the essentials into the new place, and the only things left in the old place are a couple loads of clean laundry and Jeff’s paintings. Not too shabby. I mentioned before our obsession with moving things in one trip. And even though this was during the week, so I was moving stuff alone while Jeff was working, this was no exception. So, those two loaded carts up there? Yep, I packed up the truck with all of that, and somehow, precariously loaded them up to these two carts, pushed both of them onto the elevator, and into storage, IN ONE TRIP. Two golf club bags, two bikes, two dinning room chairs, a box, a sleeping bag, and some miscellaneous stuff. I won’t say I didn’t have technical difficulties in getting it done, but I did it. 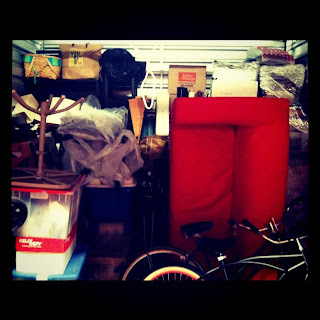 Crazy that our whole lives are packed into a 10 x 10 storage unit. It’s been there for over a month (dare I say more than two?). We pass by it everyday. She passes by it everyday. 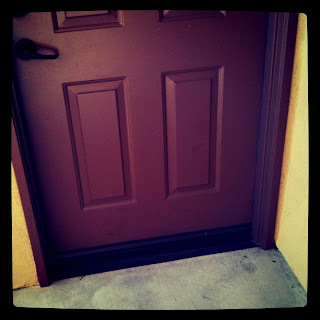 We even propped it up against her door one day, thinking she’d get the clue that she should pick it up, and nothing. So. We have some ideas. Stay tuned. I also learned that said windows are closed from 11 am to 1 pm.